We arrived in Aurangabad at around 8 am and checked in Hotel Gurjas (known as Hotel Oberoi then). Hence we could not start off early to beat the heat. We; however, had a quick breakfast in a nearby restaurant and started off in our booked taxi at around 10 am. It took around 45 minutes to reach the Ellora caves from our hotel. 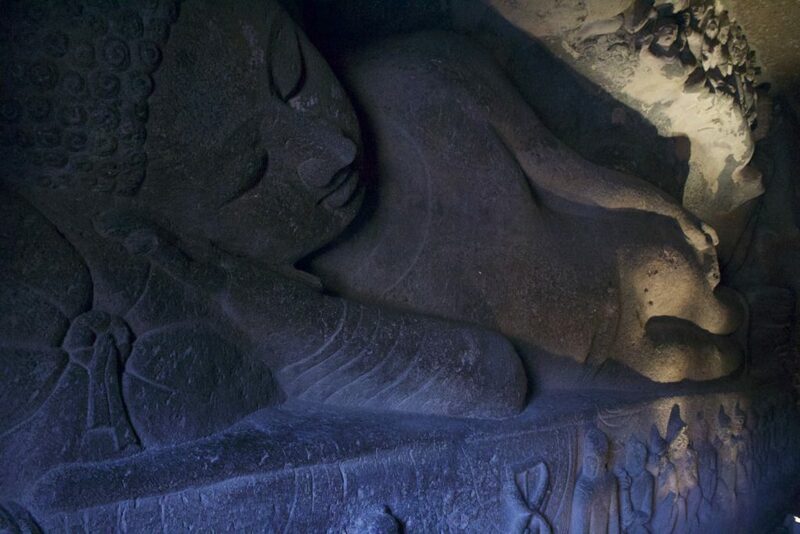 Ellora caves, also known as the ‘Verul Leni” are rock-cut caves located about 30 kms from Aurangabad. 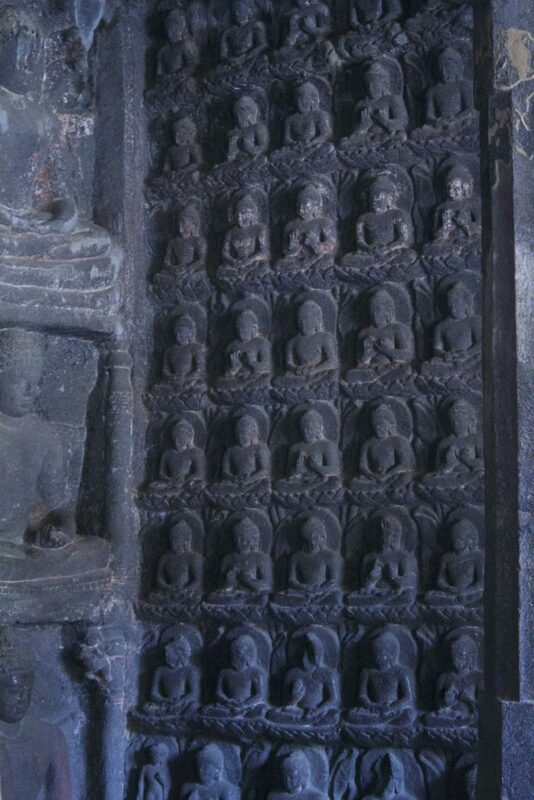 These 34 caves excavated from the vertical face of the Chandragiri hills, are actually Hindu, Buddhist, Jain temples and viharas carved out between the 5th and 10th century. There are 17 Hindu, 12 Buddhist and 5 Jain caves in close proximity to each other, reflecting the religious harmony of that era. 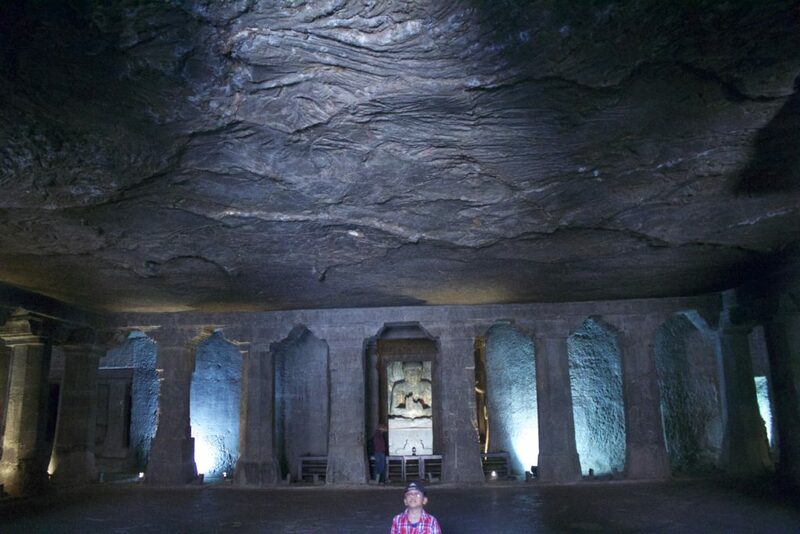 These caves are considered an epitome of Indian art and sculpture demonstrating extraordinary execution skills. Some cave structures like the Kailash temple complex are so complex that they required several generations of planning and co-ordination to take them to completion. 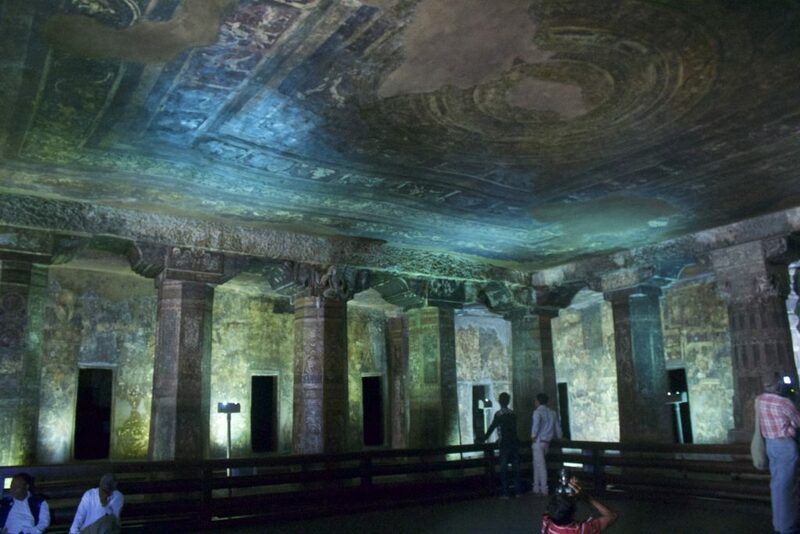 The entrance ticket for this UNESCO World Heritage Site is at a modest Rs 10 per person for Indian citizens. I wanted to hire a guide for seeing the caves but was disappointed with the unprofessional attitude of the guides there. One of the guides actually refused to speak in Marathi and said that he can only explain in English! I found that rather hilarious. All of them refused to give us time to photograph the place! In the end, we bought a information book and started exploring the caves ourselves. We started off with the Kailash temple (cave #16), which is remarkable for its sheer size, and architectural beauty. As the name goes, it is a Shiva temple within a multi-storeyed temple complex. It was carved out of a single rock, leaving the visitors today spell bound imagining the sheer amount of planning, work and co-ordination required over generations to bring the temple to completion. The two-storeyed gateway led us to a courtyard which houses the main lingam and the nandi. It took us close to 2 hours to just see this particular cave-temple. The Dashavatara (Cave 15) is right next to the Kailash temple and has a flight of steps which leads to an open courtyard, where a mantapa (natya gruha) is situated. Behind this lies a two-storeyed structure, which houses the dashavatara sculptures of Lord Vishnu. The Vishwakarma (Cave 10) is the only chaitya griha (prayer hall) at Ellora where on the stupa, a colossal Buddha in a teaching posture is carved. The Jain caves are located at some distance (1.5 kms) and a bus plies from within the Ellora complex to the Jain caves and back. 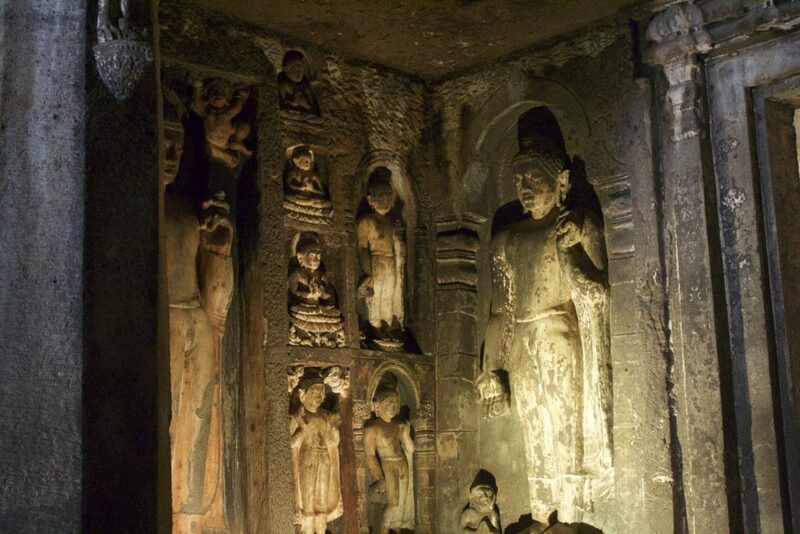 These 5 Jain caves are also detailed with intricate carvings and rich paintings on its ceilings. Since, the midday heat was already taking its toll on us and we were quite exhausted in spite of our attempts to keep us hydrated, we decided against visiting the Jain Lenis (leni = cave). We had sugarcane juice, and tried to cool down in the shade of the trees lining the entrance of the Ellora caves. Our driver meanwhile picked us up at around 2-2:30 pm and took us to Ghrishneshwar temple nearby, one of the 12 jyotirlings in the country. Note: There are not many restaurants in and around the area; however, there are a couple or so dhabas serving decent local fare. 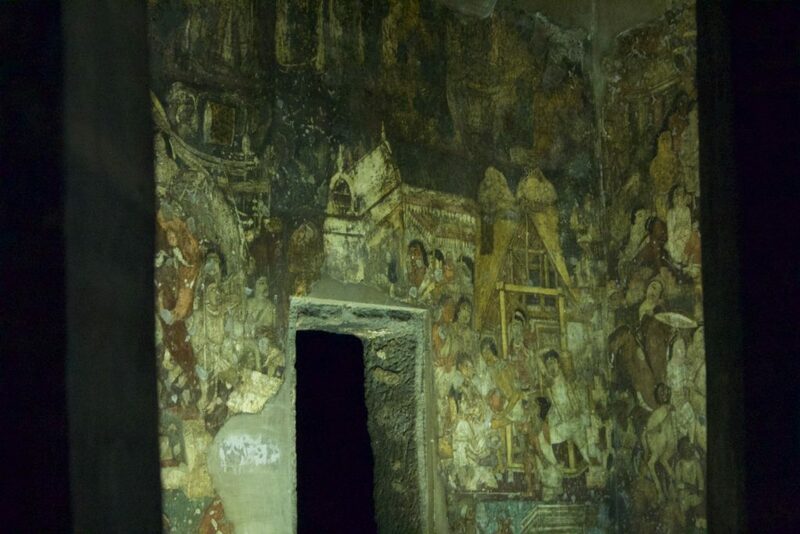 The next day, we decided to visit the Ajanta caves and started off at 7:30 am. 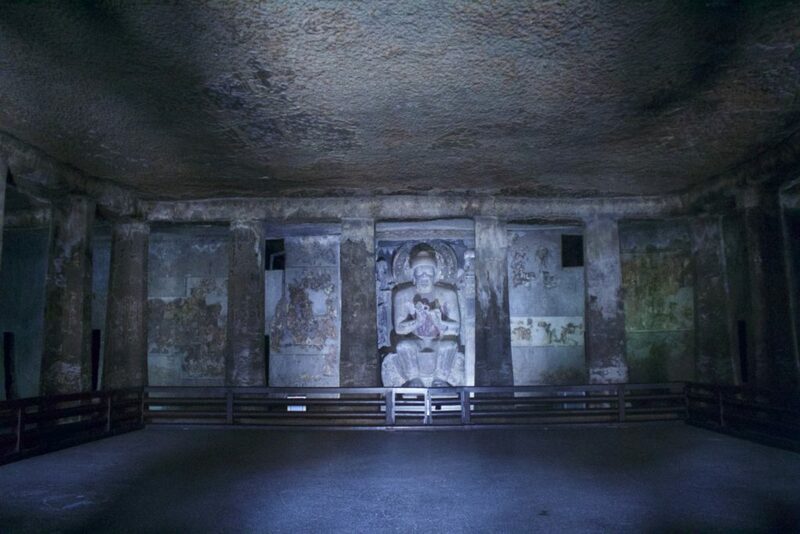 Ajanta caves, about 100kms from Aurangabad, are about 30 rock-cut Buddhist cave structures dating between 2<sup>nd </sup>century BC to 480 or 650 AD. These caves were used by the monks as chaitya grihas (prayer halls) and viharas (monasteries). Carved in a horse-shoe shaped rock surface overlooking the Waghora river, each cave was originally connected to the river with a flight of steps. However, today, the caves today are connected with a terraced path along the hill, built for the convenience of tourists. 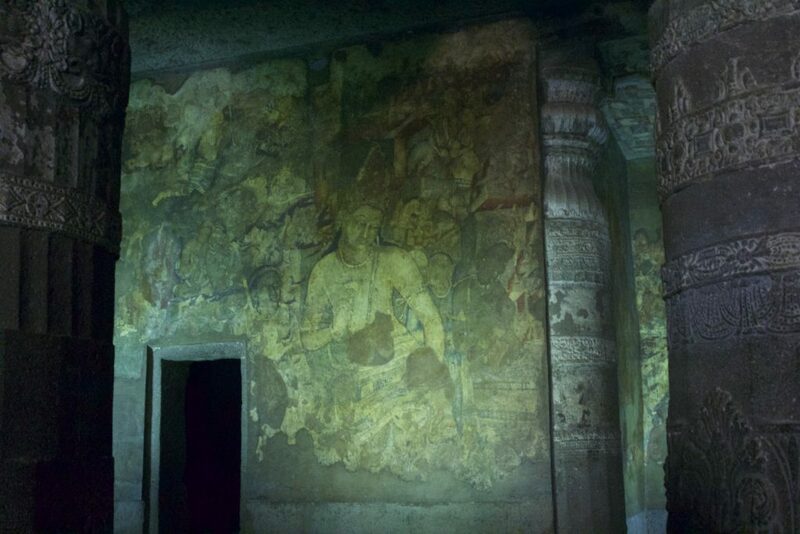 These caves preserve the masterpieces of ancient Buddhist mural paintings and sculptures depicting the scenes from the Jataka tales and the everyday life in that period. 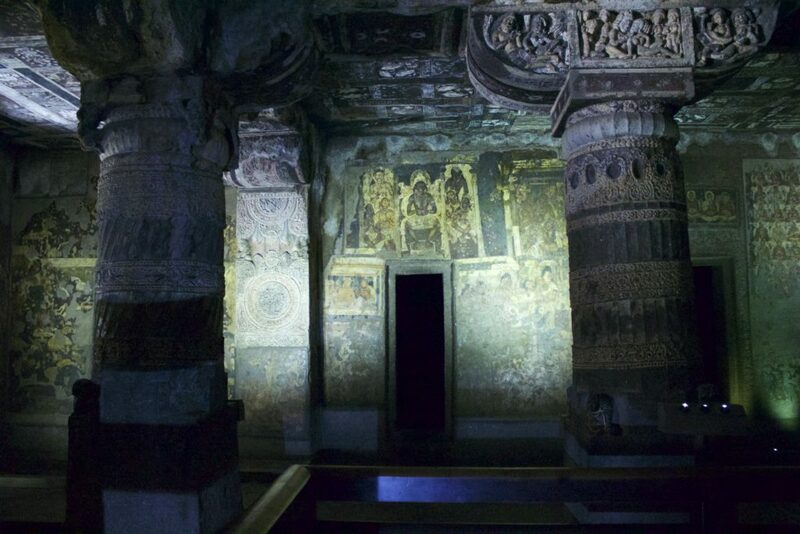 Cave # 9, 10, 19, 26, and 29 are chaitya grihas that house a stupa while the rest are viharas. Natural dyes like red and yellow ochre, kaolin, lime, gypsum, lamp black, lapis lazuli etc. were used to bring out the vibrant hues in these paintings. 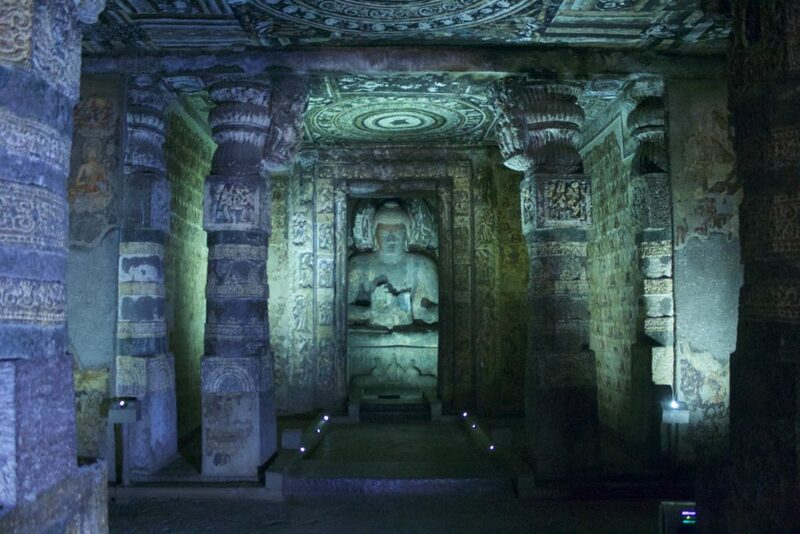 We had hired a cab and the 100-110 Km drive to Ajanta caves took us around 2.5 hours. We had a 10- minute pit stop on the way in one of the roadside dhabas for some sweet Aurangabad-style tea. After parking our car, we had to walk down for 5 minutes to the bus stop which ply CNG buses for the tourists to the base of the caves. Private vehicles are not allowed near the base of the caves to protect the murals from pollution. On reaching the base, we bought the entry tickets again priced at Rs 10 per person. There is a MTDC restaurant near the base of the caves which serves good local fare. There are hawkers selling some figurines and even sukha bhel. Since we were anticipating at least a couple of hours to explore the caves, we grabbed a couple of chatpata bhel and chana chat from the vendor and made our way to the top. We climbed a couple of flight of stairs to reach the caves.It being the peak of summer, the place was not heavily crowded and allowed us the time and space to see the caves at our own leisure.All the caves are engulfed in darkness and dimly lit in areas, which lends them a sense of mysticism. 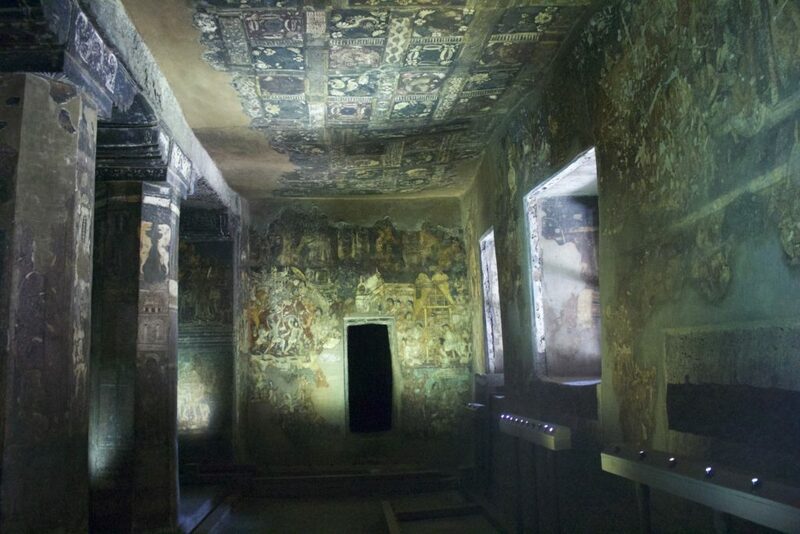 Upon entering these caves, one feels being transported back in time witnessing the majestic aura the paintings and sculptures bestow on the visitor. It is said that these caves were forgotten by civilization and were hidden under thick vegetation until 1819 when a British officer on a hunting expedition rediscovered these caves from a vantage point on an opposite hill. People today trek to that view point to capture a panoramic view of Ajanta. We began with the very first cave and by looking at the crowd there, guess it is a popular cave as well. 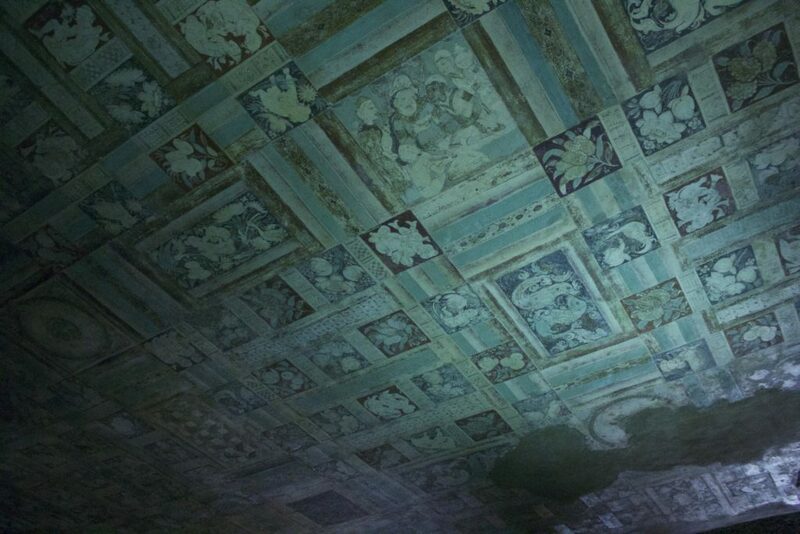 The magnificently painted cave which is a vihara, is full of murals, sculptures and paintings, much of which is worn off today. The Buddha shrine is flanked by Bodhisattva Padmapani to the left of the shrine. The lotus bloom in his hand is supposed to reflect his spiritual awakening. We proceeded in chronological order, enjoying the architecture and trying to decipher the stories behind the magnificently painted viharas and chaitya grihas. I hired guides in a couple of caves, while we were on our own (with a guide book) in the rest of the caves. We came across many well-preserved wall paintings, double storeyed monasteries, beautiful carvings and also some unfinished caves. These unfinished caves reveal the difficult rock surfaces which were chiseled and plastered to produce such beautiful paintings. It gives us a glimpse into the tremendous amount of hard work and sheer perseverance over centuries that went into making these caves the UNESCO World Heritage Sites that they are today. We hired a taxi for 2 full days to get around Aurangabad and the Ajanta-Ellora caves for Rs 3,500. Taxis are available in plenty and there is no hassle in getting one. You can request the hotel front desk to arrange for one. Dining options nearby - I will recommend restaurants Yalla Yalla and Swad Dining(vegetarian) at walking distances.